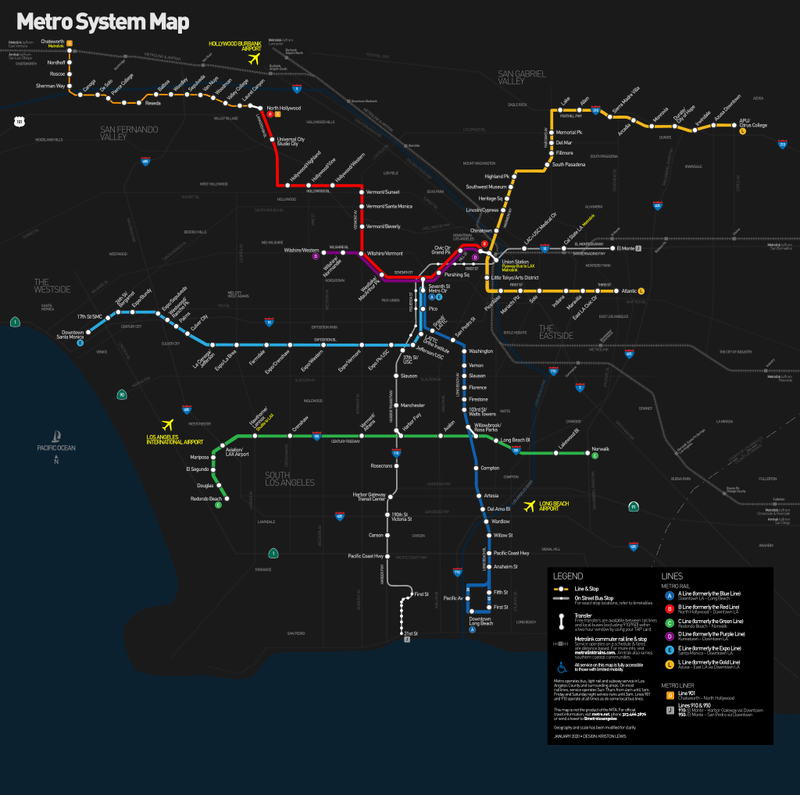 Los Angeles Metro is part of the public transport network operated by the Metropolitan Transportation Authority of Los angeles county. (LACMTA ). Known as the Metro Rail, currently the metro network in Los Angeles has 6 lines, 140.5 kms of tracks (2012), seventy stations and nearly 325000 passengers use it every day. At the same time, as a complement has the suburban train (Metro Link). It was opened in 1990 with the first section of the blue line. Red Line, connects downtown Los Angeles to North Hollywood, with a route that passes by MacArthur Park, Hollywood and Universal Studiosl. It is an underground line and the most used one. It has 23.6 kms f of tracks and 14 stations, it opened in 1993. Purple Líne, connects downtown Los Angeles with the Koreatown district trough the Wilshire boulevard. It is also an underground line. It has 8 kms of tracks and 8 stations. Blue Line, runs between the Financial district downtown Los Angeles to Long Beach. Runs trough some of the centre-south suburban towns of the county, including Huntington Park, South Gate, Willowbrook and Compton. It is a lght train line with 35.5 kms of tracks and 22 stations. It opened in 1993Se inauguró en 1990. Green Line runs between Redondo Beach and Norwalk. Runs several neighbourhoods and towns like El Segundo, Hawthorne and Lakewood. It is an elevated light train line.It was opened in 1995, with 31.3 kms and 14 stations. estaciones. This is the line to get to Los Angeles International Airport. Gold Line is a light train also, that runs East Los Angeles and Pasadena, passing by Boyle Heights, Little Tokio, Downtown Los Angeles, Highland Park and South Pasadena. It was opened in 2009, with 31.7 kms and 21 stations. EXPO Line,( turquoise line) is a light train that runs from Eastbound to Los Angeles and has been the last incorporated one, opened in 2012. With 13.9 kms of tracks and 12 stations. The metro is in service from 04.00-05.00 a.m (depending on the line) to midnight. Gold line is the one with longer opening hours (from 03.35 a.m till 02.00 a.m – almost 24 horas). Between 5-10 minutes in peak hours to 20 minutes at night. You can pay by TAP Card, (a recheargable card) or pay in cash, wich is always more expensive. The Tap Card is available in hundreds of stores: Ace Cash Express, Continental Currency Services Inc., Nix Check Cashing and in Ralphs California. Also in the tickets selling machines at metro stations. TAP card is very useful because is some transports where you can buy tickets on board, drivers do not carry change, so if you do not have exact import they can not sell you the ticket. 1 Day Pass is valid until 03.00 a.m of the following day and can be purchased on board (necessary to have TAP Card) or exact change, and also in the ticket machine. Children under 6 years travel for free if accompanied by an adult. An adult can travel with two children. Los Angeles International Airport is located southeast, in Westchester, 27 kilometres away from the city center. It has a large diversity of transports that communicate with Los Angeles downtown. FlyAway Bus Service depart from Terminal 1 and make different stops at lower level of each terminal. Between 05:30a.m and midnight, run every 30 minutes. After midnight, the service runs in different hours. There is a free shuttle bus, that picks the passengers in all the terminals, (every 12-15 minutes; from 04.30a.m to 23.00 p.m ) and goes from the airport to Aviation Station in the Green Line.